Your skin takes a battering when you ride in all weather — in the summer sun you can be left burnt and overheated; in the winter winds you can be left cold and dried out. 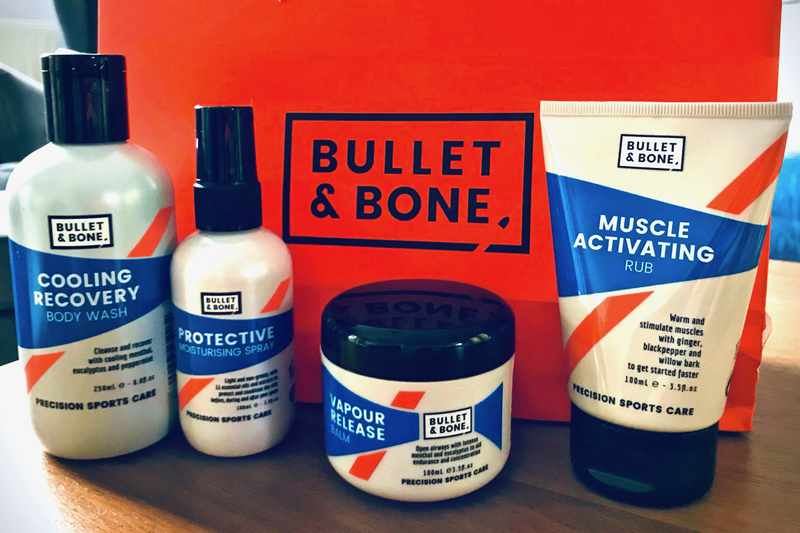 The new range of skincare products from UK brand Bullet and Bone is designed for active sports; providing preparation, protection and recovery for you skin and muscles. The range consists of four products: Muscle Activating Rub, Vapour Release Balm, Protective Moisturising Spray, and Cooling Recovery Body Wash. All of the products are designed with a specific purpose that should provide comfort and enhanced performance when taking part in active sports. The Bullet and Bone Muscle Activating Rub contains natural ingredients such as ginger, tea tree, and black pepper, which give it a subtle and pleasant smell compared to many warming balms on the market. The natural warming effect comes from the ginger and black pepper extracts, while the willow bark and clary extracts help to soothe and reduce inflammation. The Muscle Activating Rub is certainly one of the most pleasant and gentle pre-exercise rubs that I have used; it doesn't have the over-powering scent or chemical residue that some products do, but rather it has a soft warming feel and pleasant smell. I have long been a fan of natural decongestants such as Olbas Oil, which help to open up your airways and clear your sinuses; leaving you feeling fresher and breathing easier. The Bullet and Bone Vapour Release Balm is a bit like a more natural VapourRub formula, with coffee, peppermint and eucalyptus extracts providing a menthol release for your airways. The Vapour Release Balm is pleasant to use and does seem to provide a notable if fairly subtle decongestant effect for your airways. Your skin suffers a lot from the rigours of outdoor sports; with the sun, wind and rain all stripping away natural oils, and leaving you dry and uncomfortable. The Protective Moisturising Spray from Bullet and Bone is designed to rejuvenate and revive dried out skin; replacing natural oils and moisturising your skin. The Protective Moisturising Spray is unusual in that it comes in a spray bottle, compared to most moisturisers that come in a tube. The spray bottle is great for application to legs and arms though, and because the moisturiser is thinner than most, it is also more easily absorbed. The Aloe Vera extract is what provides the effective moisturisation in the formula, and the Jasmine gives the pleasant natural scent. A great option to keep the winter wind burn at bay. The Cooling Recovery Body Wash shares many natural ingredients with the Vapour Release Balm; such as eucalyptus and peppermint — these ingredients provide natural soothing and cooling properties. This body wash has fast become one of my favourites — offering a lifting aroma, and effective cleaning ingredients to remove the winter grit and dirt from your skin. Overall, the Bullet and Bone skincare collection is a small yet well delivered range of comforting care products; using natural ingredients, the four products provide pleasant and effective protection and rejuvenation for your skin.